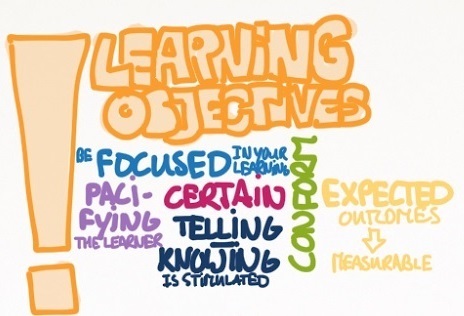 Why do we use learning objectives to describe what the aim of a training is? They are difficult to write, difficult to remember during the actual learning and often not really representative of the training in hindsight. This is even more the case in learning on the job. Is the solution to this to become better at writing learning objectives and reminding learners of them during the learning process? Or could there be another solution? I like to think that if we would use ‘learning questions’ instead of ‘learning objectives’, in many cases we could be better off. To investigate, I’ve made a comparison. After the programme, you will be able to name and explain five of the main strategic pillars of our organisation. What strategic choices have we made and how do we intend to materialise them? Should my negotiations follow certain phases? How can I prepare for each phase? How can I help people in and outside science understand what I’ve done? Objectives can be experienced as being pacifying rather than activating in a way that they limit our autonomy in choosing what elements contribute to reaching a desired outcome. E.g. Example 3 seems to limit us to learning presentation skills Questions might be more activating to the learner as they can stimulate learners to think about possible answers, or possible ways to reach the desired learning outcome. Learning objectives, in my opinion, stimulate a ‘climate’ where knowing the answers is seen as a sign of success. Knowing the answers can obviously not be a bad thing, unless it makes us disregard (people with) good questions and challenging ideas. In example 2 we are told negotiations have phases and there are identified tactics and behaviors we should apply to be successful in negotiations. Outcome might be limited to behavior or skill level. 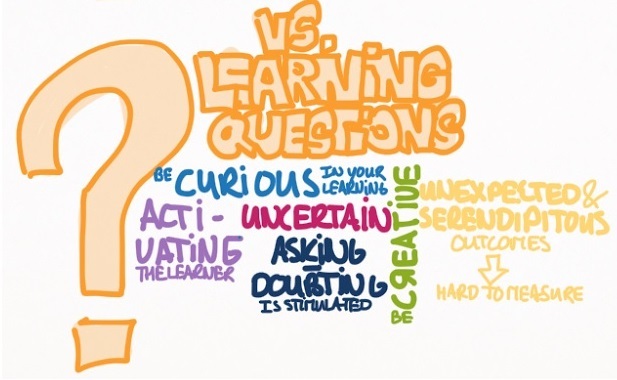 Learning questions could stimulate doubting. Although doubting is often perceived as being negative, I think it can be highly effective in combination with good decisionmaking. Finding and asking the right questions is often more difficult than answering the questions that are most available. In example 3 we are invited to consider if it would help to phase our negotiations and to think about possible ways to prepare (including tactics and behaviors). Outcome might be on a metacognitive or mindset level. The fact that with learning objectives we state more clearly the desired outcomes, means that we are more likely to reach expected learning outcomes and that we will be better able to measure learning (on the learning level, not necessarily on the behavior, result or ROI level). With learning questions, the learning outcomes might be harder to measure, mainly because they are to a large extent unpredictable. However, the value of the unexpected outcomes might be higher than any outcome we could have expected or measured, especially because they are the product of the learner’s individual learning process. I can imagine this depends greatly on the content domain of the learning. I know the comparison is not always accurate, but I hope to -at least- raise a few questions for those who are struggeling with explaining the purpose of learning initiatives (starting with myself). Q: Do you have any experience with this? Are you curious about giving it a try? Q: Would you like me to try to transform one of your learning objectives? If yes, please fill in the form below. « Learning: If it’s so hard to take it out, and equally hard to put it back in…. why take it out at all?